Charles L. Loprinzi, MD, is the recipient of MASCC’s 2018 Distinguished Service Award. The DSA, MASCC’s highest honor, is made in recognition of meritorious achievement and outstanding contributions to the society. Candidates are nominated by their peers in recognition of exemplary leadership and accomplishments in support of MASCC’s mission and goals. Charles is a Professor of Oncology in the Department of Medical Oncology and the Regis Professor of Breast Cancer Research at the Mayo Clinic in Rochester, Minnesota, USA. He is also an Emeritus Chair of the Division of Medical Oncology, Emeritus Vice-Chair of the Department of Oncology, and a Fellow of the American Society of Clinical Oncology (ASCO). Charles has been a great spokesman supportive care in general and for MASCC, in particular. He has played a key leadership role in our organization. For most of the past nine years, he has chaired the Study Group on Neurological Complications. Currently a member of MASCC’s Board of Directors, he has been reelected to serve from 2018 to 2020. Charles has also served on MASCC’s Executive Committee, as MASCC Secretary, and on our Annual Meeting Scientific Committees from 2013 to 2015. He has been active in recruiting new members to MASCC and in helping to engage members in MASCC activities. He recently chaired the Study Group Section of MASCC’s Strategic Planning Group, helping to set Study Group directions and goals for the future. At Mayo Clinic, Charles has run an active research program directed toward improving quality of life for patients with cancer, especially through “symptom control research,” which he defines as investigations to determine ways to prevent and/or treat and/or better understand symptoms caused by cancer and its treatments. He has led research on clinical care for symptoms of stomatitis, hot flashes, anorexia and cachexia, and most recently, chemotherapy-induced peripheral neuropathy. He has also mentored and collaborated with numerous investigators in symptom management research to address gaps in care for several other symptoms, such as nausea and vomiting, fatigue, skin toxicities and sexual health deficiencies. Charles has published nearly 500 papers, mostly related to supportive care, and has contributed to numerous clinical guidelines. He was the Founding Editor for the Art of Oncology section of the Journal of Clinical Oncology from 2000 through 2010. In addition, he has edited two anthologies of articles from the Art of Oncology series. 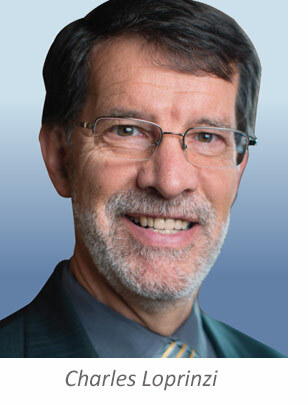 He has served on numerous ASCO, NIH, and other committees, as well as on the editorial boards of numerous journals, including Cancer Prevention International, Journal of Pain and Symptom Management, Journal of Clinical Oncology, Journal of Supportive Oncology, and Journal of Palliative Medicine. Charles is the recipient of the Susan G. Komen Foundation Brinker Award in 2002 and was named the Komen Foundation Professor of Survivorship in 2005. In 2006, he received the Clinical Research Award by the Association of Community Centers (ACCC) and the North American Menopausal Society Vasomotor Symptoms Research Award. All of us at MASCC are grateful to Charles for his contributions over the years and offer sincere congratulations to him as recipient of MASCC’s highest honor.